The top names on duty in the early encounters of Men’s Singles qualification tournament, staged prior to the Seamaster 2018 ITTF World Tour Lion Japan Open in Kitakyushu, all emerged successful on Wednesday 5th June. Chinese Taipei’s Chen Chien-An and Korea’s Jang Woojin alongside Portugal’s Tiago Apolonia and Germany’s Benedikt Duda all negotiated the opening round successfully. However, it was not on their efforts that eyes primarily focused. The focus of attention was China’s Zhang Jike, other than Ma Long the only player to hold the Olympic, World and Men’s World Cup titles at the same time. In the spotlight, it is a scenario he relishes. Most pertinently, the charismatic character duly emerged successful in his one and only match of the day. He beat Chile’s Yutaka Matsubara in four straight games (11-3, 11-2, 11-3, 11-4) and now sets up an intriguing final round qualification contest against Chinese Taipei’s Lin Yun-Ju. The 16 year old who last week in Shenzhen, after accounting for Sweden’s Elias Ranefur beat China’s Fang Bo and Tiago Apolonia before Ma Long halted progress, emerged successful in his opening round contest. In a similarly impressive manner, he beat colleague Cheng Hao-Huan without the loss of a single game (11-6, 11-9, 11-4, 11-7). 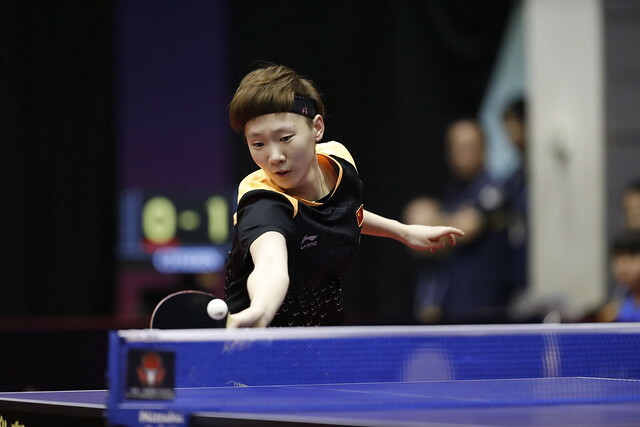 Impressive from both Lin Yun-Ju and Zhang Jike; it was the same from Chen Chien-An. He overcame the host nation’s Shunsuke Togami (11-6, 11-5, 11-7, 10-12, 11-6). Similarly, Jang Woojin ousted compatriot, Seo Junghwa (11-8, 11-3, 11-9, 9-11, 11-8), whilst Tiago Apolonia and Benedikt Duda likewise showed no charity, both accounted for Thai adversaries. Tiago Apolonia beat Supakron Pankhaoyoy (11-8, 11-7, 11-9, 11-6), Benedikt Duda ended the hopes of Yanapong Panagitgun (11-3, 11-4, 11-4, 11-5). Outcomes as expected but there were surprises as play commenced in the Men’s Singles qualification tournament. Listed at no.201 on the current Men’s World Rankings, Korea’s An Jaehyun beat Slovakia’s Lubomir Pistej, named at no.66 (11-4, 6-11, 13-15, 11-6, 11-8, 13-11). Similarly, colleague Kim Daewoo, ranked no.457, upset the ranked order by overcoming Japan’s Kenta Tazoe, named at no.92 (11-8, 14-12, 11-8, 8-11, 11-6), whilst Chinese Taipei’s Hung Tzu-Hsiang ended the hopes of Romania’s Hunor Szocs (11-6, 6-11, 11-8, 11-6, 11-4). On the current Men’s World Rankings, Hung Tzu-Hsiang is named at no.156, Hunor Szocs at no.101. The qualification tournament concludes on Thursday 7th June.